Mike Metzger, the “Godfather” of freestyle motocross, has branched out. We saw Metz at breakfast the other day, and he is really pumped about roadracing and Super TT (super motard) racing. 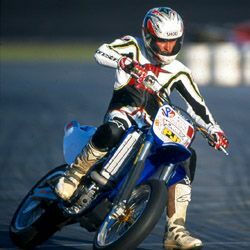 Metz rides an R1 and a motard-kitted YZ426F. Having completed Jason Pridmore’s STAR school, and Freddie Spencer’s High Performance Riding School, Metz has been performing well at local races, and may travel the roadracing circuit with Pridmore’s semi transporting his bike and gear. Metz is one of those rare guys who isn’t afraid to try anything — and he generally excels. We wish him luck.